The measurement of beam uniformity is critical when setting up or maintaining a solar simulator. 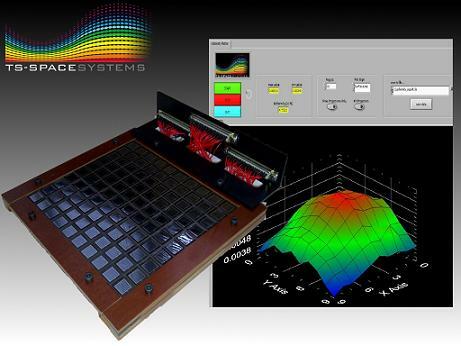 In order to reduce the time and effort required to manually position and record a single sensor reading across multiple target positions, TS-Space Systems can provide the TS Uniformity Mapping unit. The unit consists of a wired 10x10 array of calibrated, 1cm^2 Hamamatsu Si diodes which are interrogated by two high speed USB DAQ units. The included Labview based software provides a display of the beam uniformity in a variety of graphical formats (eg. as a 3D surface, 2D projection, wireframe etc.) so that the effect of optical adjustments can be observed in real-time allowing you to quickly and easily set up your simulator's beam uniformity. 'Snapshots' of the acquired data and plot can be exported to Microsoft Excel 2007 (not included) for further analysis or archiving. A 'swap-in' unit is also available for use with our 4-zone Unisim solar simulators which uses Ge based diodes in order to measure the fourth zone (1200-2500nm). You can download our free uniformity mapping Excel worksheet to help you configure your solar simulator.